Former Cardiff Blues interim head coach Dale McIntosh has joined Merthyr RFC as forwards coach until the end of the season. 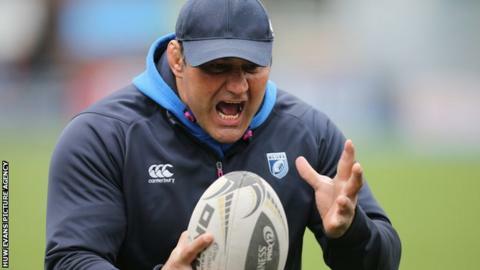 The ex-Wales back-row, 45, spent two spells alongside Paul John in caretaker charge at the Arms Park, but left after Danny Wilson was named head coach. Championship Merthyr seem set to be granted a Welsh Rugby Union A licence. That means they would be promoted to an expanded Welsh Premiership if they finish in the top four this season. Merthyr currently lead the Championship by six points, having won seven of their eight games. McIntosh, who was head coach at Pontypridd from 2007-13, will join up with Merthyr head coach Lee Jarvis and assistant Gary Horrigan. The ambitious Ironmen have strengthened on and off the field thanks to the backing of businessman Sir Stanley Thomas. That has seen more than £250,000 of improvements at their Wern stadium, while the likes of former Wales forward Andy Powell have joined the playing staff. The WRU will officially inform clubs about decisions regarding A licences in late December.